Destination British Columbia signed an agreement with Ctrip in Shanghai for strategic cooperation. 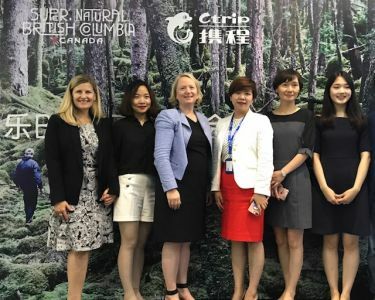 Under this agreement, British Columbia’s themed high-quality travel products will be available to Chinese tourists through Ctrip’s big data and one-stop online travel service platform. With this, Destination BC wants to boost the travel industry of BC and pursue a win-win outcome with the Chinese travel agency. The agreement was signed witnessed by executives of Destination BC including Ms. Maya Lange, Vice President, Global Marketing, Ms. Monica Leeck, Market Development Manager, Asia, and Ms. Jodie Hu, China Marketing Manager, along with Ms. Jane Chen, CEO Business Development and Destination Marketing, and Ms. Jenny Yin, GM of America, Europe and Northern China, Destination Marketing, both of Ctrip. They briefed the media and industry partners on the highlights of the strategic partnership and also attended the offline VIP club event called “YOLO BC”. With the diversification of China’s travel market, online travel service continues to thrive. China’s online travel market totaled RMB602.6 billion in 2016, growing 34% year-on-year, and is expected to exceed RMB1 trillion by 2019, according to market research firm iResearch. Entering into a strategic partnership with China’s top online travel service platform Ctrip represents a move taken by Destination BC in order to capture this opportunity. The two parties will explore a mechanism for in-depth cooperation on multiple dimensions including advertising, marketing and promotion, product development, and offline events. According to the agreement, Ctrip will create an exclusive online landing page The Wild Within for Destination BC. Visitors can choose from the four theme routes – “Urban Excitement”, “Food & Wine”, “Outdoor Activities”, and “Wildlife Watching” – based on their preferences. In addition to promoting BC’s travel products on Ctrip’s website, social media and other online channels, Ctrip will also create an online flagship store and an offline Bestone store exclusively for Destination BC to introduce its various travel resources and unique travel experiences to as many Chinese travelers as possible. In exploring China’s travel market, Destination BC targets young generations this year. The 2017 marketing theme “YOLO BC” has emerged, which resonates with Destination Canada’s theme “Jia You”. In addition, Destination BC also reorganized its resources into six thematic routes including city sightseeing, rainforest, food & wine, self-driving, cycling, and skiing for the China market so that the tourists can gain multiple experiences of nature, cultures, arts, cityscapes, and delicacies in a single trip. After the signing ceremony, the representatives of BC and Ctrip, the press, seasoned travel influencers of Ctrip together with more than 80 Ctrip VIPs attended the offline VIP club event, to share the new promotion theme, interesting travel experiences and popular routes within BC, and to help attract as many people as possible to explore the unique charm of British Columbia. According to statistics, as of March 2017, 104,353 Chinese tourists visited Canada this year, of which 55,271 visited BC, an increase of 14.2% from the same period of last year. This shows that China has become both BC’s and Canada’s largest tourist source market in Asia. There are a total of 185 flights each week from Greater China to Canada during the peak time of the 2017 summer/fall period. In addition, 13 cities in Greater China have been linked with Vancouver. Every week there are flights from Beijing, Shanghai, Guangzhou, Chengdu, Shenyang, Kunming, Xiamen, and Hong Kong respectively to Vancouver.